Usually it would take four years to start actual construction works after a project had been launched; but we did it in less than a year. 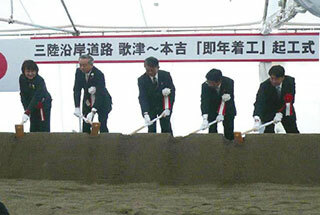 The ground-breaking ceremony was held in each project site in November 2012. In November 2011, an entire expressway connecting cites along the Sanriku Coast was designated as a “Reconstruction Road”, a leading project of the region’s reconstruction plan led by the Government of Japan. The road reconstruction project of the section launched last year has been in progress at exceptionally fast speed of less than one year to start actual construction works, thanks to the dedicated support and enthusiasm of the prefectures, the municipalities, and every local citizen involved, which would otherwise take four years normally. The Tohoku Odan Expressway Kamaishi-Akita Route “between Miyamori and Towa“ was opened to traffic. 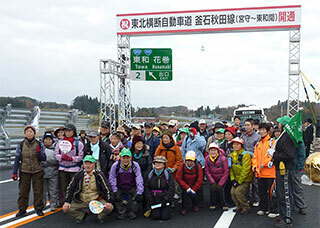 ○The section “between Miyamori and Towa” of the Tohoku Odan Expressway was opened to traffic on November 25, 2012 as the first Reconstruction Road/Reconstruction Support Road. 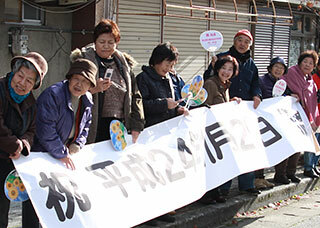 A warm welcome by people of Tono at the Tono Ekimae-dori Avenue. A road to future of Tohoku. The road network connecting Tohoku. The Nihonkai Engan Tohoku Expressway (between Kisakata and Nikaho), an expressway along the coastline of the Sea of Japan (Nihonkai Engan), was opened to traffic in October 2012, and the Tohoku Odan Expressway (between Miyamori and Towa), connecting inland Iwate and the affected areas of the Sanriku Coast, was opened in November 2012. Part of the “Reconstruction Road”, along the Sanriku Coast, was opened to traffic in the 2013 fiscal year. Growing potential as the region’s hub of industry. 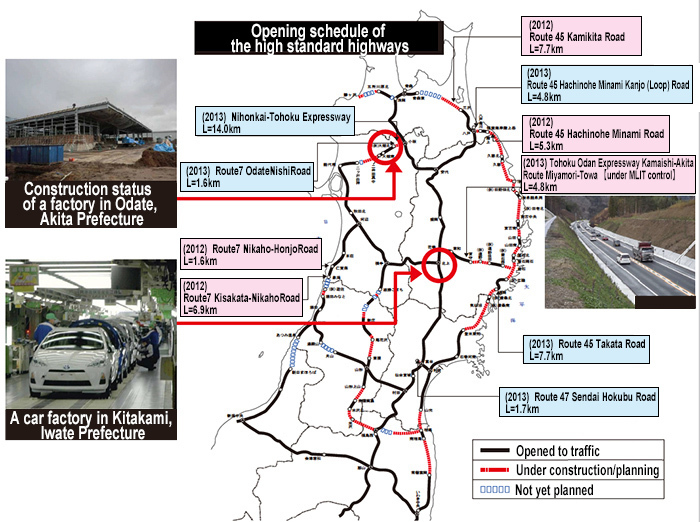 Opening of part of the Tohoku Odan Expressway will facilitate transportation to inland Iwate Prefecture from the Port of Kamaishi, promoting the productivity of the industry, for example, an automobile factory. Opening of the Nihonkai Engan Tohoku Expressway is just around the corner; there has been a record-breaking construction boom of office and factory in the industrial parks along the expressway.